From the Publisher: Fluency in Distance Learning offers a practical, hands-on, workshop style approach to creating an effective distance learning course. Full of specific ideas and strategies, the authors guide you through the process from beginning to end. Specific instructions are provided for setting up a course home page, developing interactive content, and utilizing a variety of multimedia resources. Chapters are focused on the following topics: Introduction: Insights into Distance Learning Chapter 1: KSA: Knowledge, Skills, and Attitudes of Effective Distance Learning Instructors Chapter 2: Active Learning in Online Courses Chapter 3: Multimedia in Online Teaching: Creating Dynamic Content Chapter 4: Communication is Key Chapter 5: Assessment doesn’t have to be a four letter word: TEST! 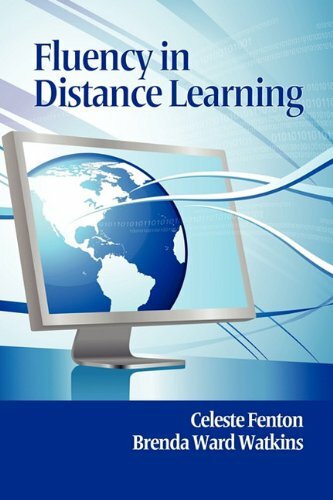 Chapter 6: Organizing and Designing Course Pages Fluency in Distance Learning distinguishes itself from other publications on distance learning with its straightforward, practical workshop format. Specific strategies and examples of effective distance learning course materials help instructors to build a quality distance learning course quickly and effectively regardless of the learning management system being used. A companion website contains multimedia files and interactive exercises to enhance the reader’s learning and understanding of distance learning pedagogy and content development for online courses. In addition, all the necessary media files for trainers to deliver a series of professional development workshops on distance learning, are also available. Potential audiences include: Instructors in need of a textbook for a course focused on distance learning pedagogy; Instructors in need of a textbook for distance learning certification courses; Instructors desiring to transform traditional instructional materials to an effective distance learning delivery format; Administrators with a need to provide professional development training to distance learning faculty; Professional development staff who provide training in distance learning pedagogy, content development, and facilitation strategies. Instructional designers with responsibility of working with faculty to develop online course(s).